It's like the West Coast. Nope, not even the slightest. Hot days humid nights. Florida was nothing like California despite the palm trees, the bikers, and the laid-back locals. Nevertheless, Key West still delivered in all its natural glory and now I see why they're called the home of the Sunset. I did my best to filter about 4 days worth of the Keys into about 30-ish images just to keep from boring you. I spent my EARLY mornings catching a glimpse of the gorgeous sun rising over Higgs Beach. Tourists go all the time to catch our solar friend but it was cloudy for the most part and we could only get a few glances when the sun peaked between the clouds. 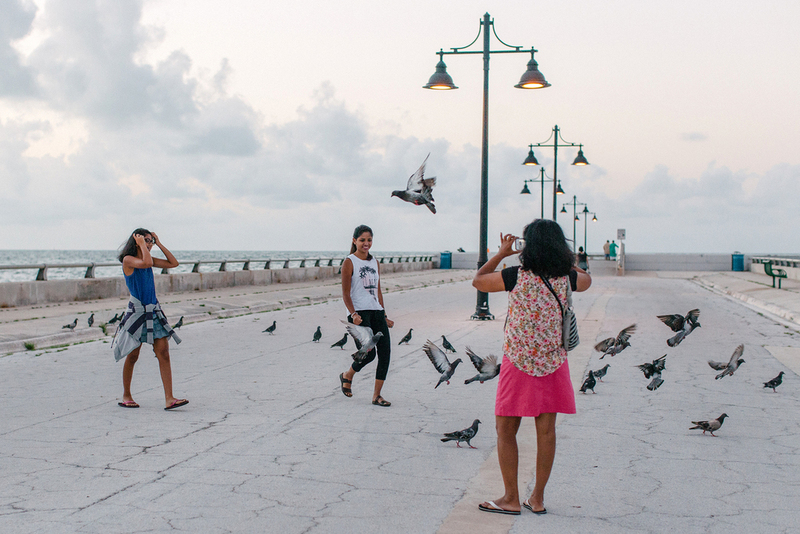 Every day was filled with biking, stuffing our face with Cuban food, eavesdropping on the French tourists, and snapping photos. Hover over the photos to read a little snippet about each one. My boyfriend's silhouette as the sun rose early - he was not a fan of standing on the ledge. Higgs Beach is a local beach that's good for sand volleyball or beach bums. Cuban Coffee Queen has some serious strong Cuban coffee and famous Cuban sandwiches. Photo Op Spot - Fun Fact: Key West is about 90 miles from Cuba from its southernmost poiint. Rainbow Crossing - a newly decorated intersection to support the LGBT community. These colors are so fantastic and really pop along Duval Street - popular area to hang out. This bird/duck had spread its wings and was just hanging out -maybe drying its feathers. Yes, thanks for thinking of the fishes. I really wish I could claim credit to this photo but my boyfriend got this shot just as a seagull was passing right by us. I did all the post editing though lol! The walk way at Higgs Beach is where pedestrians can chill in the sun or climb down to swim. Besides the beaches and the seafood, Key West doesn't have too many touristy like attractions so if you have to go to one - go to the Hemingway Home. It's about a $13 Adult Admission fee but tons of people flock to this house turned museum to scope out the nooks and crannies of this famous author and to check out the six-toed CATS!!!! Hemingway apparently had a six toed cat and its rumored that the numerous cats that live at the house now are all possible descendants. They are literally roaming around inside and out of the house doing nothing but relaxing. But the house itself is beautiful and I love looking at all the old-timeyness of the furniture, appliances, and random antique knick-knacks. It definitely seemed like the perfect getaway for a writer. Common things that pop up on the road: Scooters and Chickens. Both equally very vocal. The place that I stayed at through AirBnB was right in the central area of the island. The neighborhood is nothing like where I live. I'm used to houses with front yards and backyards with perfectly clean cut streets and signs. The area I was in was mostly alley like roads with tons of gravel and trees and plants for miles. The greenery here is incredible and if anything make all my bike riding a lot more pleasant because no two houses were the same. Huge regret due to personal issues - I missed out on the parasailing, snorkeling, and water boat activities that's offered in the Key West. I highly recommend going through and doing any of these. Next time I see ocean, I'll be the first in line. Key Lime Pie for days. Need I say more? Among chickens, I actually saw a great deal of other animals roaming around including cats. SUNSET CELEBRATION : Its a DAILY thing that happens over in Mallory Square. I highly recommend anyone going out there because its like a giant event where there are food vendors, things to purchase, entertainers to watch, and a view of the sun you can never get tired of. Fort Zachary Taylor has a nice beach area to bum around but you have to pay to get in. She was basking in the sun for what seemed like hours and all I wanted to do was cover my entire body from the rays. Fort Zachary Taylor has beautiful open waters where you can actually rent snorkeling gear and swim around watching for fish in the water. I hated the pebbled and rocky shores though. There's no sand here so I recommended bringing water shoes. If you swim out to the huge rocks like shown below - you can sit there and just watch the fish (big and small) swim in and out of the rock's little crannies. It's beautiful but beware of random jellyfish floating around. I had a close encounter with one or two of them. Best thing to do is dodge it as soon as possible. Sorry that this entry seems so jagged. I usually try to make a cohesive collection that tells a story or at least commit to a consistent aesthetic. This time around, I did a great deal of just putting my camera (and phone) away so I could enjoy the area with good company. For that, I won't apologize but hope you enjoy it anyway!